and co-author Joanne Lin (PhD, post-doctoral fellow). 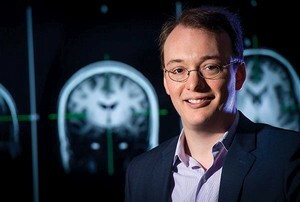 Researchers from the Neuroinflammation, Pain and Fatigue Laboratory, led by Jarred Younger (PhD) at the University of Alabama at Birmingham, and University of Miami Miller School of Medicine radiology experts published a new ME/CFS study in Brain Imaging and Behavior. 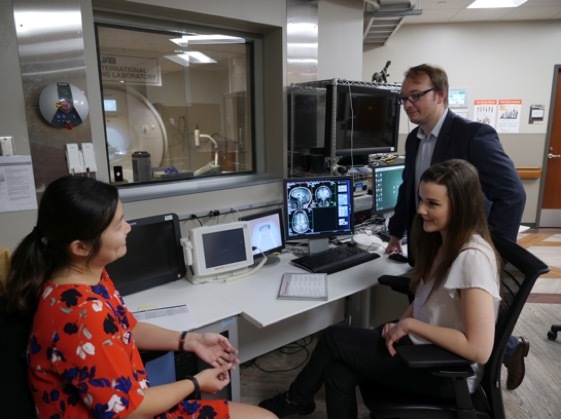 With seed funding from SMCI’s Ramsay Award Program, the researchers brought novel use of a neuroimaging tool, magnetic resonance spectroscopy (MRS), to examine inflammatory processes at work in the brains of people with ME/CFS. Dr. Younger’s pilot study provides compelling evidence that low-level neuroinflammation - present across a range of brain areas - is a factor in ME/CFS. The results corroborate previous observations of brain abnormalities, including elevated lactate, and extend findings from MRS studies that were limited to specific regions. Fulfilling a key goal of the Ramsay Award program, the data was recently used in a proposal to the National Institutes of Health to run an expanded study. /chronic fatigue syndrome: assessment with whole-brain magnetic resonance spectroscopy. Brain Imaging Behav. 2019 Jan 7. doi: 10.1007/s11682-018-0029-4. Read the full study here, and get a breakdown below. Dr. Jarred Younger and his co-authors completed a neuroimaging study of a female cohort of 15 individuals with ME/CFS (who met a modified Fukuda case definition) and 15 age-matched healthy controls using magnetic resonance spectroscopy (MRS). MRS, a type of MRI scan, provides a non-invasive method for evaluating the types and quantities of chemicals in the brain using 3D images and can give a readout of metabolic changes. The researchers found that “metabolite and temperature abnormalities were distributed across large portions of the brain” in ME/CFS participants, as compared to controls. The most significant finding was elevation of choline in the anterior cingulate (ACC) area of the brain on the left side. Increases in choline are associated with immune cell activation and the authors note that previous research indicates a critical role for the ACC region in cytokine-induced fatigue. Lactate (a byproduct of glycolysis in an oxygen-limited environment) was found to be increased in a number of brain areas, consistent with brain inflammation and an energy deficit at the cellular level. Higher average temperatures were observed in five brain areas; the researchers included assessments that showed this finding wasn’t attributable to differences in blood flow or whole-body temperature. Inflammation requires more metabolic expenditures and three of the five areas also measured increased lactate, suggesting increased metabolism that could be related to neuroinflammation. The authors acknowledge a few limitations of the study, including the small sample size, but these preliminary results support a hypothesis of neuroinflammation in ME/CFS and provide a benchmark for replication using larger study groups. → Want more information about the work of Dr. Younger? Watch an SMCI Science & Discovery webinar featuring a discussion with Dr. Younger below and check out coverage from Cort Johnson’s Health Rising blog here.